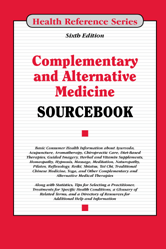 Complementary and Alternative Medicine Sourcebook, Sixth Edition provides updated information for people considering these therapies for general well-being or specific health conditions. It discusses how to select a CAM practitioner, talk with a primary health care provider about using CAM, evaluate information on the internet, and pay for CAM therapies. Chapter 1—What Is Complementary and Alternative Medicine (CAM)?